(edit)and you should always make backup-copies of the save-game-folders before installing any mod! At some very seldom points in the game there is too much text in the NVL-window and you can't reach choices/options you can't see. This problem increases, as I add text to the choices/options. I've "rewritten" the NVL-window of RenPy, if there is too much text to be displayed, it automatically scolls most down, additionally you can scroll with the mousewheel. Roll-forward-backward is always reachable by PageUp/Down. If you want to use the mousewheel to roll-forward-backward! 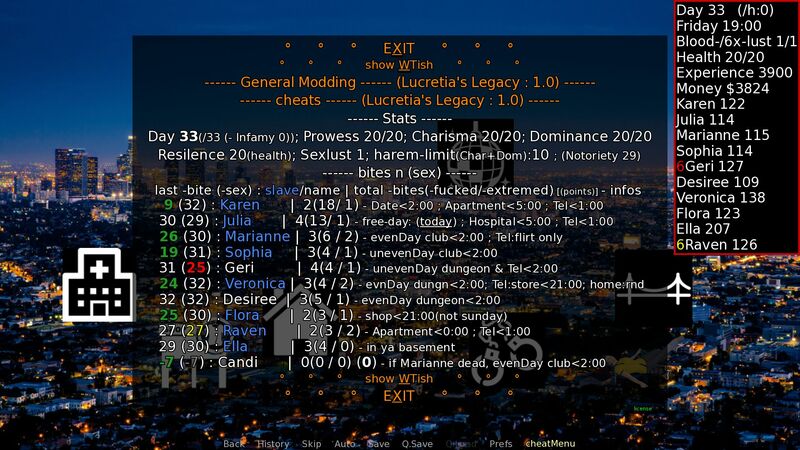 (selectable at General Modding) a scrollbar is shown at the right, but its top is "under" the "stats-screen". You can still scrolling by clicking-holding-and-moving. I've set this to dynamically calculated height of entries, but this takes a lot time! Normally(default) there are 250 entries in the history; I've set that to 50 which I assume to be enough backreading, and the imact on performance seems ok.
press "0" to reset to start! -There's a small error when visiting the store with Veronica, it is possible that the Flora-image is not hidden. -another small error is when you go dancing with Veronica and Lucretia has to scold you, the images are placed center instead left...not corrected! (surprisingly) enabling/disabling has direct impact even on the choice you are confronted with, right now!